I've always been attracted to reading news stories and articles about anything weird. A sheep being born with two heads, a squirrel who thinks he's a dog, and of course a person living to an unexpectedly old age. These stories fascinate me and they break the norm from the daily stories about death, crime, and violence. I turn to Ripley's to satisfy my cravings for anything strange and out of the ordinary. Ripley's has been entertaining fans and visitors for over 90 years with over 80 exciting attractions in over 11 countries. The brand offers best-selling books, a syndicated TV series, and the longest continuously published newspaper comic in history. Ripley's delights people with odd, unique, and incredible artifacts, stories, art, and photographs. Some of my favorite exhibits and stories are the animals with oddities, the tallest woman in the world, people with many tattoos or piercings, and of course the woman who cries glass. I've been a fan of the TV show for years, and I just started reading the books recently. Let's say I'm beyond hooked! Last year I even visited the Ripley's Believe it Or Not Odditorium in New York City. If you're looking to get your Ripley's fix, let me introduce you to this year's annual, Dare to Look! Go ahead and open the book, I dare you! This hardcover book is chock full of incredible facts, crazy stories, amazing pictures, and lists and interviews too. A fun thing about this book is that it also comes with bonus hidden content which is accessible when you use the Ripley's smart phone app! If you're looking for something to shock you and make you say wow, this book is the perfect pick for you. I remember watching it on tv and seeing the people with the really long fingernails. I always wondered how those people went to the bathroom! I went to the one in Hollywood and the one in San Francisco but that was long ago and I can't remember specific weird displays. They always had strange stuff. I also saw it on TV. Oh yeah, sorry for the second entry...the conjoined twins. I remember watching Ripley's with my family and always discussing the outrages things on the show. I love seeing the people from other cultures doing things that they consider normal, yet we think are weird. I live next to a Ripley's Exhibit, and it is one of my favorite places to go for fun. I believe I have seen people on there with ridiculously long mustaches. That is always funny! We used to watch this when I was a kid and I remember one about circus contortionists. It was wild how they could bend. Went to the Ripley's in San Antonio, there was a purse made from testicles. Wierd. My favorite Ripley's oddity was a display of Jivaro indian shrunken heads. That and a favorite childhood memory was visiting Robert Ripley's house in Santa Rosa California. My memory of Ripley's is watching it on TV and see the man made himself look like a tiger. I never been to the museum yet but it's one of the things on my bucket list. I love the pictures....they always tell 1000 words !!! It's amazing some of the things that the human body can do. My kids & I visited the one in Newport Oregon & had a blast..such cool stuff. My favorite memory is over family pic---all sitting in the oversized Ripley's chair. I remember the TV show with Jack Palance as the host back in the day! That show was so much fun to watch w/my Dad when I was a child. I can remember when they had paperback books published on a regular basis when I was growing up and I would always read them at my grandmother's house. I have always loved them. I was always intrigued by the Siamese Twins. I remember the shrunken heads from the WI Dells Ripleys. My dad and I went in there all the time growing up around the area. My favorite memory is from 1978. A bus load of my graduating class took a trip right after we our graduation to Gatlinburg. While there we visited the museum. I think they are still recovering from us being there 35 years later. I love the Ripley's museum near Orlando -- I love how the whole building looks like it's leaning. We used to live near Branson, Mo and the kids always wanted to go to Ripleys first. They love the real shrunken heads and there is some kind of illusion house inside. My favorite memory of Ripley's is taking my kids to Ripley's aquarium in Myrtle Beach last summer. Thanks for the chance to win! I remember watching the guy stick needles through his skin on T.V. I remember watching the guy stick needles through his skin on tv. my brother collects these books. and he would love to add this book to his collect. my husband took me to the ripley museum once in tennessee it was really fascinating all the stuff they have it takes hours to see everything. 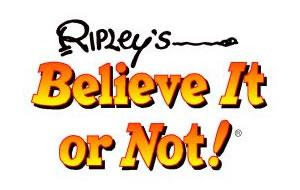 I recall the Ripley's Believe It or Not comics in the Sunday newspaper when I was but a lad! I always loved the rubber band ball. I enjoyed years ago going to the ripley's museum in Wisconsin dells. I went to the museum in New Orleans when I was young. Creeped me out. I remember going to the museum with I was about 14 years old. I saw some pretty freaky stuff in there. I used to love Jack Palance's grin when he would say, "Believe it or not"
I remember a lady that could Bulge her eyes out real big!! It really grossed me out!! I remember watching the show but i have not been to the museum. I remember the lady with those crazy long fingernails! I liked the "man marries his pillow" story. I thought it was funny. I like the funny not gross. MY son loves the gross though. my husband and i enjoy going to the ripley's believe it or not in st augustine florida and looking at all the strange things! I remember watching the show with Jack Palance hosting! I can't stand gross stuff so I don't know if I'll look but this might be a cool gift for someone else I know! We have a Riley's museum here actually too.